When people talk about barn owls, they usually mean the western barn owl (Tyto alba). This is not the only owl of this type, though. In fact, there is an entire family of barn owls. On the broad taxonomic classification of these birds, however, there is general agreement, although experts differ on the details once you get down to species and subspecies level. Taxonomically, the term "owls" refers to birds of prey of the order Strigiformes, most of which are nocturnal and subsist on a diet of small mammals and, occasionally, invertebrates, birds, amphibians and reptiles. A few species eat fish. The defining characteristics of owls in general include their body shape -- for example, unlike hawks and other raptors, owls have eyes facing forwards -- and the exceptional flexibility of their necks. Less obvious physical characteristics include rather fleshy tongues, by bird standards, and the absence of crops in their digestive systems, one of the reasons that owls produce pellets. The family Tytonidae -- barn owls -- is one of the two main types of owl living today. The other is the family Strigidae, or true owls. 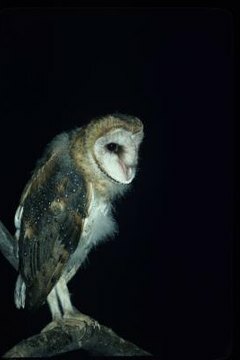 The main visible difference appears in the faces -- barn owls have heart-shaped faces while true owls have circular ones. Barn owls also tend to have relatively smaller eyes and longer beaks. They have a wide geographical distribution, although most species inhabit tropical regions. This family contains two genera, which show enough differences that they have been put into two separate subfamilies. These are Tyto, subfamily Tyroninae, and Phodilus, subfamily Phodilinae. Phodilus species, commonly known as bay owls, are particularly small and have “ear” tufts on the top of their heads. Tytonidae contains about 18 known species, an indefinite figure because debates are still ongoing about which barn owls constitute separate species and which are subspecies. The majority of these species belong to the Tyto genus, although they don’t all have the term “barn owl” in their common names. Examples include the African grass owl (Tyto capensis), the sooty owl (Tyto tenebricosa) and the Taliabu masked owl (Tyto nigrobrunnea). The western barn owl is by far the mostly widely distributed and the best-studied species, with information about most of the others being extremely scarce.